What a year in the California Vineyards! In 2011 it was a “perfect storm” of strong winds, hail, devastating frosts, thunder-storms, cool summer temperatures, heat spikes and then September rain and then more rain in October! Not all growers had the same luck. The Yin – Here are comments culled from a few growers in the state. The wine country is, of course, a great place to visit while wineries are busy transforming grapes into wine. During the Fall there are fewer people about and the mood is more relaxed than the Summer months. Tasting rooms and restaurants are less crowded and glad to see you. What’s that in the vineyard? 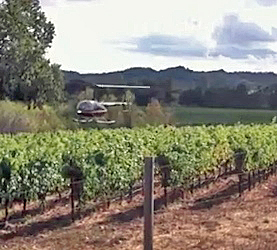 To dry out the grapes this year, vineyard owners went so far as to enlist the aid of helicopters to fly low and blow-dry their crop. The Yang – Winemakers see bright quality and opportunity. With the extended growing season the fruit stays on the vine longer. Extended “hang time” adds greater complexity to the grapes and can result in some remarkable wines. This is an opportunity for winemakers to create elegant restrained wines with a balance of flavor, fruit, acid, alcohol, oak and varietal nuance. Growers are glad their year is over, winemakers are busy and hopeful for some great wines and us consumers are eager to taste the results! It is a balance of nature after all. *The ancient Chinese subscribe to a concept called Yin Yang which is a belief that there exist two complementary forces in the universe. One is Yang which represents everything positive or masculine and the other is Yin which is characterized as negative or feminine. One is not better than the other. Instead they are both necessary and a balance of both is highly desirable. FlipKey's Flippin' Awesome Vacation Giveaway!